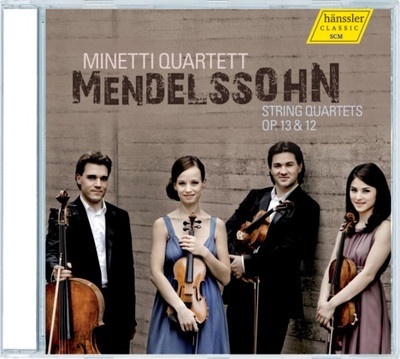 "A musical sensation from Austria" wrote the Berlin Tagesspiegel of the young Minetti Quartett's debut at the Berlin Philharmonie in 2009. The name "Minetti Quartett" refers to a play by famous Austrian author Thomas Bernhard (1939-1989), who lived in Ohlsdorf, the birthplace of the quartet's two female members. The "European Rising Star Series" presented the Minetti Quartett during the 2008-09 season on the stages of the prestigious European concert halls. Since then appearances included Wigmore Hall, London, Concertgebouw Amsterdam, the Koelner Philharmonie, Palais des Beaux Arts Brussels, Festspielhaus Baden-Baden, Mozarteum Salzburg, Beethovenhaus Bonn, Birmingham Symphony Hall, Konserthuset Stockholm and of course the Vienna Musikverein. Die Presse in Vienna summed it up after one of those concerts: "The youthful freshness of the quartet's interpretations charms audiences since 2003. There are top musicians with spirit and dedication at work who charge the music of the classic and romantic periods with energy for the new millennium".